Model 46DR. Runs on 12V DC. Compact, efficient, long life motor. Describe the nature of the problem and its urgency (include pictures if possible). This item has a 3 Year warranty covering any manufacturer defects. Volts = 12v GPH 405FC. Gallons Per Hour = 1100. Inlet Style = Seacock. New rule 2000 standard bilge pump new never used. Part number 25DA. Replaces the discontinued Rule 25D bilge pump. Runs on 12V DC power. ISO 8849 and ISO 8846 marine certifications. Describe the nature of the problem and its urgency (include pictures if possible). You are buying one Rule 360 pump. No box included.12 volt pump, you can use a car battery, truck battery, riding lawn mower battery.Tested with no problems. Use it on boats, jet skis, household pools, standing water, plumbers use it. Rule General Purpose Pump 12v 3700 #17A New In Box. Free Shipping. Condition is New. Fast and free shipping priority mail. No Alaska,Hawaii or APO address. No international shipping. Rule 2000 GPH Bilge pump Model 10 Heavy Duty 12V . Condition is New. Shipped with USPS Priority Mail Small Flat Rate Box. W/ Rule-A-Matic® Plus Float Switch. Rule-A-Matic® Plus Float Switch. Sleek and rugged, the Rule-A-Matic Plus float switch has a strong, fully integrated, impact resistant cover, which protects against debris and jamming. Trending at $64.11eBay determines this price through a machine learned model of the product's sale prices within the last 90 days. Rule 32AL Dash Mounted Visual / Audible (85 dBA) Panel Mount Gauge. 24 Volt ONLY. Supplied with an adaptor for all major inflatable boats. Can be operated with one hand. Part number 25SA. Replaces the discontinued Rule 25S bilge pump. Runs on 12V DC power. ISO 8849 and ISO 8846 marine certifications. Automatic electronic sensing – No float switch needed! This item has a 3 Year warranty covering any manufacturer defects. boat accessories Complete kit Rule Oxygnator flow 700 GPH. Condition is New. Shipped with USPS Parcel Select Ground. Item has been tested and is in great working order but has signs of use. 12 Volts DC unless noted. Used by leading boatbuilders worldwide. Rust and Corrosion protection. No burn-out when run dry. Ignition protected. Compact, efficient long life motor. Model 405FC. Runs on 12V DC. ISO 8846 marine ignition protection. 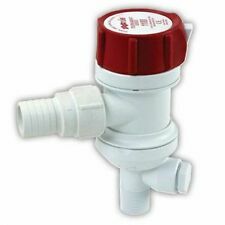 Dual port fitting for optional washdown pump. Describe the nature of the problem and its urgency (include pictures if possible). This item has a 3 Year warranty covering any manufacturer defects. Bilge High Water Warning with Wa. Bilge High Water Warning with Water Level Detector, 12v. Monitors bilge water level and lights Red Light on the warning panel and sounds a loud panel. 110 Volt with 8-Foot Cord. Automatic operation. Gentle-Flow™ Oxygenator is the ideal system for keeping bait and catch alive and healthy. The patented infuser technology introduces air into the base of the livewell pump producing millions of micro-fine bubbles. Removable cartridge. Fits almost any custom tank. Kit comes complete with pump, directional discharge, intake strainer, hose and intake valve. Model 255 - up to 25 lbs. of bait. Model 256 - up to 50 lbs. of bait. A genuine Rule product, don't settle for anything less, 2 year warranty. Can be used to operate Rule High Water Bilge Alarm. I HAVE A MASSIVE INVENTORY OF JOHNSON-EVINRUDE-OMC PARTS INCLUDING CURRENT, NON CURRENT, OBSOLETE, NLA AND USED. New Rule shower drain box. Model 98B (replaces 98A). For use with 12V DC systems. This compact, full-capacity shower drain system provides 800 GPH (3028 LPH) of output. Powerful 800 gallon-per-hour pump (3028 LPH). New Rule 1800 GPH fully automatic sump and utility pump. Model A53S. Runs on 110V AC and includes 8 foot grounded 3-prong US-spec power cable. Uses up to 100 watts. Double insulated pump motor is permanently lubricated. While fully automated, the pump will only turn on when the water level rises. There is no cycling and battery drain. The pump remains off until the internal float switch rises. The pump then stays on until the water is evacuated. New Rule high water bilge alarm kit. Ignition protected. Gauge has both visual and audible 85 db alarm. Gauge requires 2.125″ hole cutout. Complies with CFR 182.530. Describe the nature of the problem and its urgency (include pictures if possible). 12 Volts DC unless noted. Used by leading boat builders worldwide. Rust and Corrosion protection. No burn-out when run dry. Ignition protected. Compact, efficient long life motor. Manufacturer Part Number: 291010000. (4) Liquid like maintenance products. (3) Paint and chemicals. (1) Open software. (below the price of the item). HAZARDOUS PRODUCTS (HAZMAT). FREE LOCAL PICK UP. Fuse size is 7 amp. Maximum air temp is 130 degrees F. Slip on inlet and outlet ducting connections. ABYC – H2 (Ventilation of boats using gasoline). ISO 9097 Marine (Electric fans). Describe the nature of the problem and its urgency (include pictures if possible). Rule-Mate RM500A 500 GPH Fully Automated Bilge Pump 12V DC Marine Boat 3/4"
New Rule fully automated bilge pump. Model Rule-Mate RM500A. Fuse size is 3 amp. Pump turns on when water level rises and shuts off when water is removed. Describe the nature of the problem and its urgency (include pictures if possible). 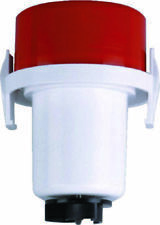 800GPH Standard Bilge Pump - 12V. And we're just getting started. Under each strainer tab there is a small hole that vents any air trapped in the pump housing preventing airlocks.and that's how we do it. Length x 11 1/4 in. width x 5 1/2 in. height Replaces Rule 98 Replaces Jabsco 30296-2012. 800 GPH 12 Volt Shower Drain Pump. Drain box has capability of accepting up to three separate intake lines. Replaces Rule 98. Rule 3800 GPH (14380 LPH) general purpose pump. Model 17A. Runs on 12V DC systems and has 1-1/2″ inlet and outlet. 13.6 volts: 3800 GPH (14385 LPH) at 0 kPa, 3185 GPH (12050 LPH) at 10 kPa, 2570 GPH (9718 LPH) at 20 kPa. Part number 27DA. Replaces the discontinued Rule 27D bilge pump. Runs on 12V DC power. ISO 8849 and ISO 8846 marine certifications. Describe the nature of the problem and its urgency (include pictures if possible). Length x 2 3/8 in. width x 3 3/4 in. Rule 20R bilge pump. Round 12 volt DC pump with 3/4 in. Round model bilge pump. 800 GPH / 3028 LPH flow rate. 12 volt DC operation. Snap-off pump base strainer allows removal of pump motor to clean out debris. Part number 20DA. Replaces the discontinued Rule 20R bilge pump. Runs on 12V DC power. ISO 8849 and ISO 8846 marine certifications. Describe the nature of the problem and its urgency (include pictures if possible). Livewell Pump. Debris Strainer. Stainless Steel. Screws directly to the pickup tube of all Rule straight. Model 47DR. Runs on 12V DC. Compact, efficient, long life motor. Describe the nature of the problem and its urgency (include pictures if possible). This item has a 3 Year warranty covering any manufacturer defects. RULE 3-WAY LIGHTED PANEL SWITCH MODEL 41 (12V) A 24.99 SPECIAL. JUST 4 U. Fully Automated Bilge Pump. The rule-mate bigle pump is thoughtfully designed, and due to its compact profile, can be used in practically all bilge pumping applications. Each pump is easily installed with the pump and switch internally wired. 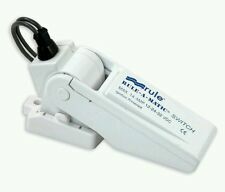 Rule-Mate RM1100B 1100 GPH Fully Automated Bilge Pump 12V DC Marine 1" 1-1/8"
New Rule-Mate fully-automated boat bilge pump. Model RM1100B (replaces RM1100A). Flow Rate: 1100 GPH (4164 LPH) max. Pump turns on when water level rises and shuts off when water is removed. Describe the nature of the problem and its urgency (include pictures if possible). Manufacturer Part Number: 439900000. (4) Liquid like maintenance products. (3) Paint and chemicals. (1) Open software. (below the price of the item). HAZARDOUS PRODUCTS (HAZMAT). FREE LOCAL PICK UP. The Rule General Purpose Pump must be mounted below the waterline. 24 volts DC. Gallons Per Minute = NONE.